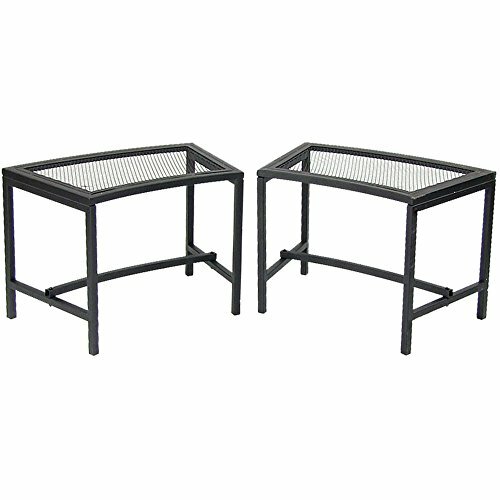 This set of 2 fire pit benches is the perfect mesh patio bench for your fire pit, patio, garden or around a tree. Durable steel construction, mesh seat, easily portable and works perfect for round fire pits with the backless, curved design. Each bench seats one person and comes with two fire pit benches. Each fire pit bench measures 23 inches long x 13 inches deep x 16 inches tall; weight capacity: 330 pounds; giving you a comfortable place to sit around the fire. Includes 2 fire pit benches to add extra seating to your outdoor space. Outdoor furniture makes the perfect companion for patio and backyard fire pits because they fit around fire pits so well.